An environmentally friendly backup power generator, with no fuel costs. This solar powered generator can be set up in just a few minutes, then, all you have to do is start plugging your appliances. The Nature PowerPak Solar Generator will run both AC and DC appliances, without producing noise or fumes. There is no maintenance and most importantly, no fuel required. Equipped with a sealed lead acid deep cycle 80 Amp hour battery, is maintenance free and enclosed in a heavy-duty outer cases. This unit provides 1800-Watt of electricity of perfect power. 3600-Watt surge power and 1440-Watt of continuous. Whole kit arrives on a pallet 24x17x14.25 in. and weights 150 lbs. 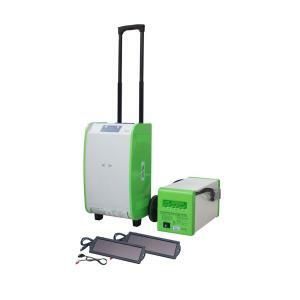 Tbook.com crawls the web to find the best prices and availability on Generators and related Tools and Hardware products like Nature Power 1,800-Watt Indoor/Outdoor Portable Generator 160 Starter Kit. For this page, related items include products we find that match the following keywords: "Generator GENERATOR" at our vendor partner Home Depot. Nature Power 1,800-Watt Indoor/Outdoor Portable Generator 160 Starter Kit is one of 152 Generators and related products listed in the Tools and Hardware section of Tbook.com If you have any questions on this product, please give us a call at 734-971-1210 during the hours of 9am - 5pm EST for assistance. Thank you for shopping at Tbook.com, the Internet Department Store!